We're tracing David Einhorn's rise to investing fame, his tough 2015, and how he's responded in 2016. David Einhorn is a hedge fund manager with an estimated net worth of $1.5 billion. Through his fund, Greenlight Capital, Einhorn has made a name for himself as a talented short-seller as well as long-term value investor. He's most known for his 2002 short bet of Allied Capital and, later, his short position against Lehman Brothers that he kept open all the way to the company's bankruptcy. When David Einhorn was seven, his family moved from New Jersey to Milwaukee, Wisconsin. David was a big baseball fan as a child, a passion that continues to this day (though he now cheers for the New York Mets, rather than his childhood team, the Milwaukee Brewers). Einhorn excelled as a student, standing out as a member of the debate team at Nicolet High School, one of the top schools in Wisconsin. After high school, Einhorn attended Cornell University, where he again performed well. He graduated with a degree in government and was elected Phi Beta Kappa. Post college, the burgeoning investing star spent a few years perfecting his craft on Wall Street before founding Greenlight at age 27 with just over $900,000 in assets under management. A short 20 years later, and the fund today manages over $8.6 billion of client money. The fund's success is the driving force behind Einhorn's personal net worth of $1.5 billion. 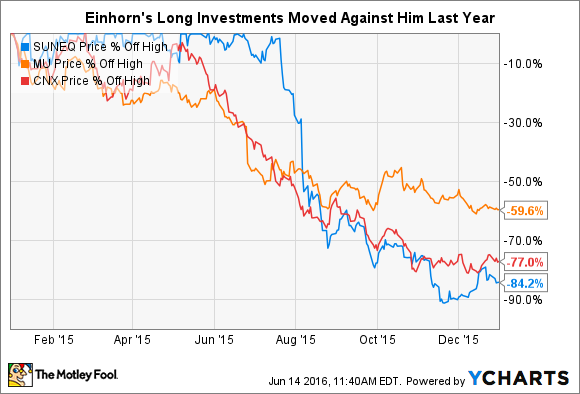 2015 was arguably the most challenging year in Einhorn's investing career. Greenlight saw assets under management shrink by $3.2 billion in 2015 following a 20% investment loss for the year. The fund's annualized returns still average 16.2% since its inception in 1996, despite the troubles in 2015. The investment mistakes were widespread. Greenlight failed to cash in on gains from a long investment in SunEdison before the stock tanked in July of 2015; it ended the year 84% off its summer highs and eventually filed for bankruptcy protection in April of 2016. Investments in Micron Technologies and Consol Energy also moved decidedly against Greenlight. These three stocks combined to push the fund's entire long portfolio down 17% for the year. 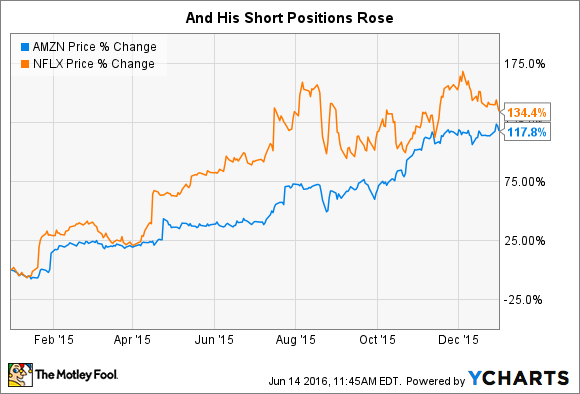 2015 was a tough year for Einhorn on the short side as well. The short portfolio squeaked out a meager 0.4% gain. Through Greenlight, Einhorn bet that Amazon.com (NASDAQ:AMZN) and Netflix (NASDAQ:NFLX) would both fall. The two stocks ended the year as the two top-performing stocks on the entire S&P 500, each with gains well above 100%. His short position in Keurig Green Mountain (UNKNOWN:GMCR.DL) performed well until the company was acquired in December for a premium, wiping out much of the hedge fund's gains. It has been a while since we've had a profitable quarter to report. Though we would like to make it a habit, trying to manage for quarterly results is really not our philosophy. With the long term in focus, where is the fund allocating its capital now? The most notable new position is a long investment in review website and app Yelp (NYSE:YELP). The first-quarter letter rates the company "five stars," citing an upside scenario that doubles revenues by 2019 and a contingency scenario where the company scales back, with great profitability, to its largest 20 markets. Greenlight purchased the shares at an average price of $21 and predicts the stock could top $55 in the next three years. The fund initiated new long positions in two mortgage REITs, American Capital Agency (NASDAQ:AGNC) and Hatteras Financial (UNKNOWN:HTS.DL). Both purchases came at a significant discount to book value, and each mREIT currently yields well above 10%. Other than those new positions, several existing bets turned around as well. Consol Energy, for example, rallied 43% in the quarter. Another long bet, Michael Kors Holdings (NYSE:CPRI), jumped 42% over the same period. Those gains were offset by the previously mentioned bankruptcy at SunEdison and a 32% drop at Japanese bank Resona Holdings. Regardless of how Einhorn's current bets play out in the short and medium terms, he's an investor worth paying attention to for his fundamental approach, excellent research, and long-term focus. Einhorn diligently researches the companies in which he invests, formulating a strong fundamental thesis before putting a dime on the line. While not averse to other strategies, he's most often seen using a value-based approach to investing, not dissimilar to Warren Buffett, Ben Graham, or even The Motley Fool. He's also focused on the long term, an advantageous time horizon too often ignored by Wall Street and the financial media. Einhorn put it thusly, "We think one of our advantages is the ability to be more patient than others, especially as investment horizons appear to be getting shorter."